Was reminded today of the fact that me, captain dork of the dork squad, on the dorkcycle known as a KLR650, was about the only featured rider of an off road trail video put on by a powersports dealership. This means I have sweet footage of my bike sitting still on a dirt trail and sweet sweet footage of me grabbing a gatorade out the back of a SxS after falling over a bunch and having to right a 400+ lb motorcycle on sand. Repeatedly. 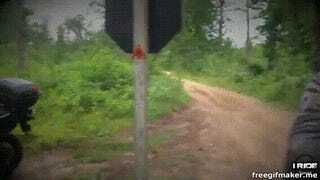 Anyways, enjoy this sweet gif of guys in a 10,000$ SxS being amazed that I am off road in a KLR. Also that I rode there from a city 85 miles away and stayed the night in a lodge nearby the night before. And only brought with me what fit in that top case.